These items appeared separately in the original version of the Around Naples Encyclopedia on the dates indicated. They have been consolidated onto a single page here. There are 12 items. The city of Naples, in its never-ending quest to bring art to the masses and especially to the masses who ride the subway to work, is not just going to spruce up the soon-to-be-finished university station at Monte Sant'Angelo with a few paintings or statues or even bronzed old jalopies disguised as installation art. They have hired British/Indian artist Anish Kapoor to turn the entire station, itself, into a work of art. The station will be among the deepest in Italy (about 40 meters) and—well, the area is in the Phlegrean Fields, not far from the mythological descent into Hades— so, says Kapoor: "We want to create the impression of a Dantean descent into the underworld." No one seems to know exactly what that means, and few are in a hurry to find out. It's hell getting to work, anyway. 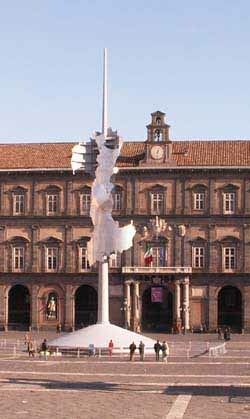 Neapolitans are most familiar with Kapoor from his gigantic site sculpture, Taratantara, originally created for the new Gateshead's Baltic Centre for Contemporary Arts in England in 1999, but then set up in Piazza Plebiscito (photo) in Naples in December of 2000 as that year's contribution to the annual exposition of installation art. The title is meant to be echoic of the sound made by a trumpet fanfare, as in Roman poet Quintus Ennius' line, "At tuba terribili sonitu taratantara dixit" — ("But the trumpet sounded with its terrible taratantara", the onomatopoeia usually left untranslated). Indeed, the sculpture suggests two funnel-like trumpet bells joined and flaring out to both ends, something like those strange geometric figures that scientists use to describe what sort of transdimensional hyperspace thing (a technical term!) we shall have to traverse if we ever hope to reach the stars. 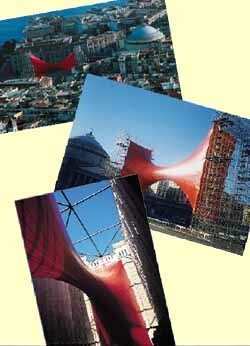 Taratantara was made of a shiny red membrane, glittered in the sun, was about 50 meters long, 20 high and was anchored in Piazza Plebiscito by steel columns at each end. While it was up, the columns were scaled by demonstrators. They weren't out to damage the sculpture, and didn't, but the offices of the Naples Prefecture bounds the north side of the square and that's always a good place to have a demonstration. An English art student's work was thrown out, literally, after an official at a Birmingham art center mistook it for trash from the opening day party. Ceri Davie's "Piece de Resistance" involved red jellies displayed on plates and was intended as a metaphor of decay. ‘Months of hard work had just gone to waste,’ the artist said. "I was quite horrified." Very few of us realize the tough row that artists have to hoe in dealing with Philistines such as that art center official. This is probably because practical hoes weren’t even invented until the Middle Ages. As far as we know, the Philistines just got down on all fours and grubbed their rows into shape with their hands. Many years before the Decadent Red Jelly affair referred to above, one of the artist’s earlier works, Empty Paper Picnic Plate —which consisted of an empty paper picnic plate— was not all well received by critics, who found the title too hard to say five times real fast and who also mistook "empty paper" as a metaphor of life instead of a Minimalist description of paper picnics, the plate itself being just a secondary, but sardonic, appliquè —which was just as well, since it too was given the old heave-ho. Fortunately (maybe), it was saved, since the art center official who tossed it, threw it into what he thought was a trash bin, but which, in fact, was also past of the art show. And then there was the artist’s Hamburger, those little pointillist nibbles of semi-conceptualist cholesterol-laden ground Bœuf, a yummy but still youthful version of her later, futuristic, Quarter-Pounder With Cheese, in which patrons of the art show were required to flip burgers in the kitchen, then ask themselves in the drive-through microphone if they “would like fries with that?” and then —ah, the stochastic power of it all!— eat or not eat the work of art! How was the artist to know that they had scheduled the exhibit in the same hall as a dog show? It was to her credit as a resourceful master of Performance Art that she retitled the whole thing, Gone to the Dogs, A Metaphor. (Or Maybe It’s a Simile). I spent three years on this! A veritable mountain of chips, shards, bits, detritus, little stone chunks lying where they fell, all at different odd angles, each one with a special metaphor to it, deconstructing, as it were, the sordid and complex confusion of our times. And in stone!—in Carrara marble as eternal as the plots, counter-plots and intrigues that surround us. I was going to call it something like Plots, Counter-Plots and Intrigues. (Ok, I hadn’t given it that much thought, yet.) I figured it was about time someone put it all into permanent artistic form. Why paint anymore?! The colors will just fade and then someone will come along and invent cartoonists and hire one of them to touch up my Sistine Chapel with paint-by-the-numbers Day-Glo! So I finish it and leave it outside. Where else am I going to keep it, in my living room? This morning it’s gone. Those morons took the waste rock and put it on display! ‘It looks just like a boy with a slingshot. Cool!’ they said. And my work of art? ‘Oh, that crap? We threw it away,’ they said. I was talking about this with Leonardo From Vinci (man, what a one-horse burg that dump is!). He has strung an invention of his, a ‘talk gizmo’ between his house and mine —two ceramic cups and a very long thread. It works all right, except that since our houses are many miles apart, communication kind of breaks down when Tuscan peasant women somewhere in between start hanging laundry on the line. He says he’s working on a very long thread on a spool, which would actually let you converse as you walk around the street. Like I’m going to hold my breath waiting for that one. He asked me what I was doing wasting my time with rocks, anyway, when I could be building things he called ‘aeroplanes’. He told me he was undecided about what to paint on the part he called the ‘fuselage’ —an eagle carrying lightning bolts in its talons or a chubby women with a smiling face. I suggested a smiling woman holding lightning bolts. He was not amused. A weird man, Leo. Frankly, I don’t think the old geezer is playing with a round boccie ball, anymore. I'll see your metafour and raise you five. Installation art; memento mori; "skulls"
The large and spacious square between the main façade of the Royal Palace and the Church of San Francesco di Paola is Piazza del Plebiscito. It is ideally suited for outdoor concerts, street musicians, jugglers, and large groups of tourists to shuffle nervously as they are efficiently herded from statue to statue by stray dogs. The square also lends itself to modern sculpture of the kind that art critics call "installation art" and the rest of us rustic dullards call, "What in the world is that supposed to be?!" Generally speaking, installation art requires some —well,installation— something in the way of mounting, draping, hanging, digging or soldering. The displays, themselves, may include ("...but are not limited to...," as lawyers so craftily hedge) metal, wood, plastic, rubber, and assorted minerals, fabrics and liquids. And so, in past years, Piazza del Plebiscito has seen a gigantic mountain of salt dotted with pieces of machinery, apparently a metaphor of whatever it is that salt represents confronted with whatever it is that machinery represents —maybe life beset by technology. (Hey, not such a "rustic dullard" now, huh?!) Then, one year, there was a large wooden replica of an ancient lighthouse that used to guard the harbor of Naples. Last year, there was a gigantic replica of the Angevin Fortress made entirely of soft-drink cans (photo). These exhibits go up in early December and are left in place for the Christmas holidays, at which time they are "uninstalled". Most of them are environmentally friendly enough to be dismantled easily or, in some case, vacuumed up. In December 2002, they tore up the paving stones in the square. According to the paper, no one in the city administration recalls giving the go-ahead for any of this digging, but the latest piece of ephemeral sculpture was duly installed. It is a work by German sculptor and film maker, Rebecca Horn. Her history includes mechanical and body-extension sculpture as well as installation art on the premises of an insane asylum in Vienna. Austria. Her work is often controversial. The work consisted of a number of bronze skulls implanted in the pavement (photo). The work, thus, is Horn's tribute to, or variation on, the well-known Neapolitan "cult of death" (so-called by some) that centers on the vast collection of human skulls on the premises of the Fontanelle cemetery in Naples. The work is "site specific," a sub-genre of installation art, in that it makes sense only within the context of the place where it is exhibited, in this case, Naples. The Fontanelle cemetery is carved out of the tufaceous hillside in the Materdei section of Naples. The vast chambers on the premises served for centuries as a charnel house for paupers. At the end of the 19th century, Father Gaetano Barbati had the chaotically buried skeletal remains disinterred and cataloged. They then remained on the surface, stored in makeshift crypts, in boxes and on wooden racks. From that moment, a spontaneous cult of affection for, and devotion to, the remains of these unnamed dead developed in Naples. Defenders of the cult pointed out that they were paying respect to those who had had none in life, who had been too poor even to have a proper burial. Though the practice has largely disappeared, devotees used to pay visits to the skulls, clean them —"adopt" them— giving the skulls back their "living" names (revealed to the caretakers in dreams). Yes, all that. The display of skulls gives the whole thing a resemblance to the memento mori. This Latin phrase means "Remember you must die". As a noun, it thus means "a reminder of death". Historically, it recalls the slaves whose job it was in ancient Rome to ride in the chariot beside Conquering Hero and whisper that single killjoy phrase ("Remember you must die") in his ear, just to keep Hero from believing his own press releases. 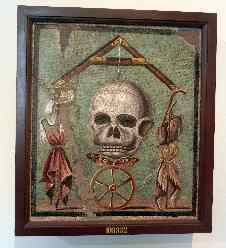 In a Christian context, the "memento mori" plays a significant part in Neapolitan iconography. It is seen as a reminder to live the kind of life that will be judged worthy when that time comes. 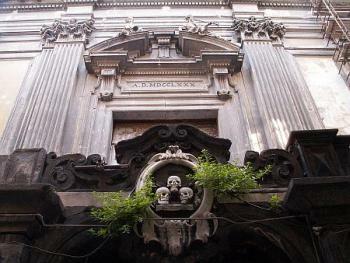 The courtyard of the museum of San Martino (an ex-monastery) displays carvings of skulls prominently, and a few churches in Naples have depictions of them on the façades or within, most notably, the Church of Purgatorio ad Arco on via Tribunali. 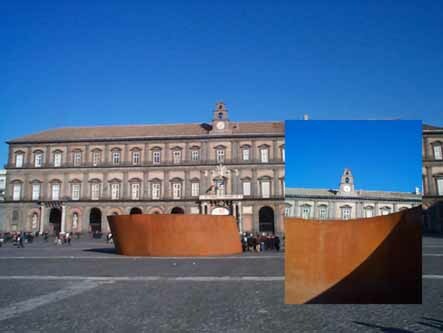 This year's ritual installation of art in Piazza Plebiscito features a work entitled "Naples," by the master of massive minimalism, San Francisco artist Richard Serra (1939-). It is a large spiral (already called "Contraception of the Gods" by those who view with some disdain the city's unabashed dedication to this kind of display). Entering into the giant orange sculpture of curved and bending steel plates, you spiral in, leaning in and out with the curves of the walls, to the center, where you can look up and see the clock tower on the facade of the royal palace (see photo and insert). Your perception as you navigate the deceptive geometry of this small, tilted space set in the larger space of the square, itself, is what gives validity to the work, says the artist. Clearly, to be a private experience —to be at all touched by the suggested metaphor of yourself in a similarly skewed private life-space set in the space of the world at large— the wandering in and out is best done slowly and alone and not as part of a curious herd elbowing their way in and out, unless, of course, you spend much of your time elbowing your way through life wondering what it's all about. That, too, is possible. The work bears an amazing resemblance to Serra's earlier "Torqued Ellipses," done in 1996, separate curved plates of towering steel, which, to the untrained maximalist eye, with a bit of imagination, might be fit together into a spiral. 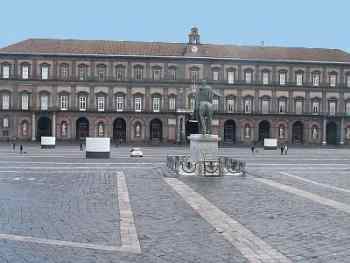 It has been ten years since the city of Naples started adorning the vast Piazza Plebiscito with examples of "Installation Art", exhibits of various kinds put in place in December and then taken down after the holiday season. Some of these works have evoked bewilderment in the eye of the beholder. Or hostility. Or admiration. That of, course, is what such art is meant to do: spin a web of extended discourse around itself, made up of people's reactions, which themselves become part of the answer to that nagging question: "What in the world is that supposed to be?" Such works in the last decade in Naples have included Mimmo Paladino's "Salt Mountain," Anish Kapoor's "Taratantara" (#1, above), and Rebecca Horn's exhibit of bronze skulls, "Spirits of Mother of Pearl," embedded in the pavement itself (#2, above). First of all, the division of the gigantic representation of Italy into two —the Two Italies— recalls that split in the national psyche, something that might not occur to foreigners, but which is ever-present in the minds of all Italians, even a century and a half after unification. Second, in spite of the metal construction, the tower is probably best called by the religious or Baroque term, "spire"; it is set up in the middle of a large square, recalling two other large, permanent spires in Naples (at Piazza del Gesù Nuovo and Piazza San Domenico Maggiore), and is, in fact, a tribute to the importance of the piazza in Italian history —the public gathering place. This is where people talked, danced, bought and sold, where revolutions started, proclamations were read and even executions carried out. "The city is born from the square, not vice versa," says Fabro, in an original poem that accompanies the explanatory notes. It is the perfect site in Naples to generate questions about the modern identity of Italians, a people that have been among the great bearers of European culture over the centuries. The exhibit has some interesting sidelights. One is the presence of various mathematical and musical symbols affixed to the colonnade of the church of San Francesco di Paola, the building on the west side of the giant square. (These are, I suppose, tributes to the Greek origins of Naples and Italian scientists and musicians of the past. It also reminds me that one year, the entire exhibit consisted of a single Fibonacci sequence arrayed around the semicircular facade of the church; 1, 1, 2, 3, 5, 8, 13, 21, 34... They stopped when they ran out of columns or when Fibonnaci died, but I am still engaging in my own internal "extended discourse" about that one. Stay tuned.) Also, Fabro has put together a sound track that will be heard around the square for as long as the exhibit lasts, repeating 25 segments; they range from an ancient Greek chorus to an Ambrosian chant to the classical music of Cimarosa and Pergolesi to, ultimately, a recording of Marconi's first radio message. 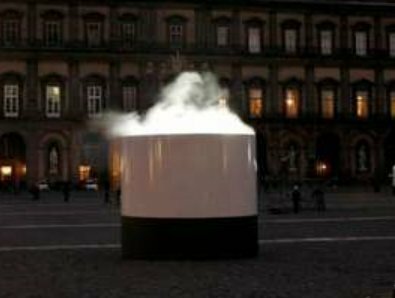 For some reason, there will be no exposition of installation art at Piazza Plebiscito this year. I've just been down there and it is bone-bare, unless, of course, Christo has managed to install a gigantic sculpture of thin air of emptiness hanging over the entire square, called Thin Air of Emptiness. On the other chisel, the on-going shoring-and-sprucing up of the Galleria Umberto may be viewed as installation art, of sorts. I call it Shoring-and-Sprucing Up of the Galleria Umberto (photo, right). Alas, this means that there will be no large Christmas Wishing Tree this year on the premises. Come back in Twenty-oh-Nine. I spoke too soon when I said there would be no installation art at Piazza del Plebiscito this winter. They put it up a bit later than they normally do, and I didn't check back. This year's artist is Jan Fabre (b. 1958 in Antwerp, Belgium). He is described as "multidisciplinary"; he is a playwright, stage director, choreographer and stage designer. He also founded the Troubleyn theater company in Antwerp in 1986. Fabre has recently exhibited at the Louvre in Paris. 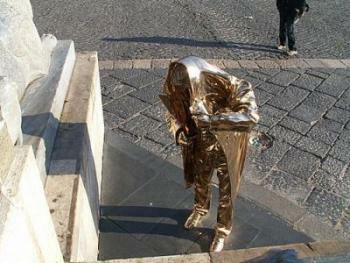 His exhibit at Piazza del Plebiscito consists of five bronze sculptures, some of which have previously been shown individually in public spaces elsewhere. Thus, while the positions of the "parts" in the square no doubt mean something, the "whole" is not technically "site-specific" (that is, not made specifically and only for this square in Naples, say, in the sense of Rebecca Horn's Skulls a few years ago—#2, above). The five sculptures are: The man who measures the clouds (1998); The man who gives fire (or...with a light) (1999); The man who cries and laughs (2005);The astronaut who directs the sea (2006); and The man who writes on water (2006). 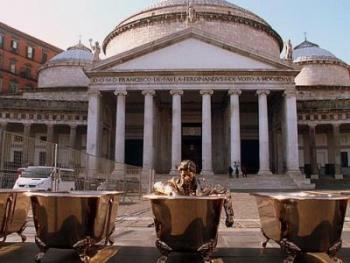 The pieces are all of brilliantly polished bronze and are life-sized; they are set around the large semicircular piazza in front of the church of San Francesco di Paola (background, photo on right); ...cries and laughs (photo, above) and ...writes on water (photo, right) are in the main portion of the square; ...gives fire (below, left) is off to the side; ...measures the clouds (not shown) is actually atop the far-left half of the colonnade of the church; and ...astronaut who directs the sea (not shown) is not in the square at all, but on a balcony of the Royal Palace, which faces the square. Currently (as you can see in these photos), the entire display is cluttered by scaffolding and bleachers being set up for the New Year's Eve celebration. I say "clutter," but maybe it's part of the display. You never know with installation art. In the pompous vocabulary of art critics (cue professorial throat-clearing...ahem...), such displays are meant to interact with the viewing public and invite comments, comments that then become part of the "extended discourse" of the work, itself. In the case of Fabre's display, the morning after it went up, there was a single car parked directly next to the centerpiece, The man who cries and laughs (top photo); it is in the center of the square and shows a man atop a pedestal, facing the royal palace. His facial expression, as the name implies, shows laughter and crying at the same time. You are invited to interpret that as you wish. (That is, he is holding a book in his left hand, so maybe he's a student or, even worse, a scholar. He is staring at the grand Royal Palace and smiling at the centuries of culture therein contained; he is also crying because Naples is in such a mess. That sort of thing. That is only my own "extended discourse." Feel free to extend your own. Maybe we can throw a few punches.) The lone car in the morning hours was interpreted by passers-by in various ways: (1) It's part of the work; (2) It's the world's cleverest example of illegally parking a car, since the owner knows that people will think the vehicle is part of the work and leave it alone. -"What in the...?! He can't leave that car there!" -"Luigi, maybe it's part of the sculpture. If we ticket or tow it, we look like idiots." -"Do I look like an art critic to you? Call someone." A few hours later, the car was gone. That doesn't necessarily mean that it was not part of the sculpture. Maybe it was a piece of mobile extended discourse. The exhibition runs through Jan 18, but these displays sometimes run past the announced closing date. There was no printed explanatory material for this year. Here extendeth the discourse. This year’s “installation art” at Piazza Plebiscito was supposed to open yesterday, but there was an unspecified technical hitch; thus, we’ll have to wait a few days to see “Pioneer II.” It is an example of what is called “sound art” or “Cymatics” —the visualization of sound; that is, seeing the patterns caused, say, in sand or in a liquid, by sound vibrations. This physical link between the heard and the seen has interested a number of artists. You can test the effect by covering your Stradivarius with flour and starting to play. You see pretty pattens in the flour as it is “excited” by the sound—just as you are excited by the sudden drop in the value of your fiddle. This year’s artist is Carsten Nicolai (b. 1965, Karl-Marx-Stadt, Germany). He has installed three large balloons moored with metal cylinders in the square (photo, right). The balloons are equipped with internal light sources and are electronically linked to motion detectors on Mount Vesuvius. Rumbles at the volcano are translated into audible pitch and run through loud speakers set up in the square. The effect of that sound causes something to happen to the balloons, but I don't know what. The purpose of it all is to show how intimately the city is linked to the volcano. So, if the metaphorical "balloon" at Vesuvius really does "go up" next week, I think the physical artsy balloons, too, will really go up like crazy and explode. So far, the cylinders are all you see. The exhibit will be in place through Jan 12. Art is hell. Art is hell redux. The installation art at Piazza Plebiscito (above) didn't get off the ground. The art has been "uninstalled"—that is, the balloons have been removed from their cylinders. The display was too fragile, the windy weather wasn't helping, and, apparently, one of the components had already been damaged by a pre-New Year's firecracker. The museum that contracted for the display, MADRE Museum (an acronym for Museo d'Arte Donna Regina), spent €500,000 on it and now says that the artist, Carsten Nicolai, has some reserve art warming up on the sidelines. It will probably be called "Clouds of Light" and will probably reuse the same cylinders that contained the balloons. It should be in place by tonight. Ho-hum. The suspense is killing me. OK, art is only heck. Except for the ongoing stink about how much money was spent on this fiasco, the crisis has been overcome by the installation of three "volcanoes of light" in place of the three large balloons. The physical set-up is almost identical; that is, there are now three large cylinders representing Vesuvius (and his two twin brothers?) in the square. At night you can enjoy the light display over the rims of the "volcanoes." The display is accompanied by volcano-ey rumbles of sound effects. At night, that is. Interesting point: this particular work of installation art is "site specific" (that is, the theme is bound to a particular place, in this case, our local volcano). That is not uncommon for installation art (Rebecca Horn's 2002 display in Naples was another example—#2, above). But this one is also time-of-day specific; you can only see it at night. If you know nothing of the display and walk across Piazza Plebiscito on a bright sunny day and see only the cylinders, you will no doubt work out some plausible interpretation of what it all means. This, of course, will have nothing to do with volcanoes. Not to fret —in the parlance of modern art criticism, your interpretation then becomes part of the "extended discourse" on, of, around and about the work. Feel better? This year's "installation art" is significantly different than most of the displays since they were first started over a decade ago in Naples. 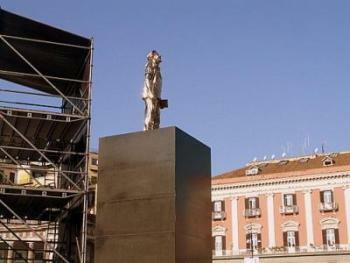 For the first time, the display will not be set up in Piazza Plebiscito. This is (1) bad in that not as many people will see it but (2) good in that there is much less chance of damage, accidental or otherwise, to the installation from Christmas and New Year's revelers. Also, the display will be "site specific" (much like Rebecca Horn's "skulls" exhibit—#2, above—from some years ago). 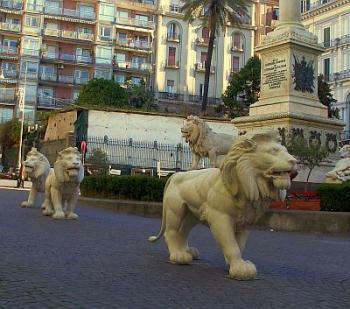 This year, the venue will be the Piazza dei Martire, the monument column in that square includes four statues of lions at the base. The display could be set up nowhere else since it consists of six life-sized fiber-glass replicas of one of the originals, the "prowling" lion by Tommaso Solari. The replicas have just stepped off their monument pedestal, symbolizing, according to the artist, a "reawakening" of the city. 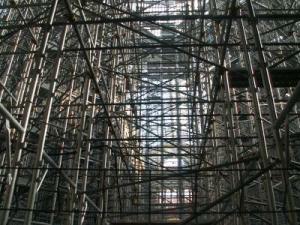 The installation is the work of Neapolitan artist, Nadia Magnacca (b.1958). She has a degree in biological sciences and has studied and taught photography; since the early 1990s she has exhibited photography and audio-visual displays throughout Europe. That she is a local artist, while not unique, is the exception rather than the rule for these exhibits of installation art in Naples. Maybe that's a good sign, too. As it turns out, there is nothing new under the sun. In 1972, a group of local artists calling themselves the "non-existent gallery" installed a plaster lion in the same square near the memorial column. No one seemed to mind, so they graduated to trying to unload a whole parade of similar critters along the seafront leading from the Castel dell'Ovo to Piazza dei Martiri (more than a half-mile!). This time, the local gendarmes were not amused. The artists did get permission, however, to put a few in the square, itself. The display was called Hic sunt leones—"Here there be lions." And here they are again. This year the city has taken a step back from its yearly tradition of presenting large-scale "installation art" at Piazza Plebiscito (or anywhere else, for that matter) during the holiday season. (I don't know if this means anything as far as the format of future displays is concerned.) Maybe people were tired of the very large and very expensive single-theme works (see the above items on this page). They were often by artists from abroad, so maybe, too, local artists got tired of being snubbed. This year, the theme seems to be "local artists," presented under the title of Percorsi di Luce [Trails of Light]. Essentially, most art and photo galleries, artists' workshops/studios around town, and other venues where displays can be set up (such as hotel lobbies) are open almost constantly and will remain open through January 6. It amounts to a large-scale moveable art show, with you doing the moving from exhibit to exhibit, from the works of French illustrator (who lives in Naples), Christophe Mourey, to video-art by Tony Stefanucci, to papier-mâché sculpture by Rosa Panaro, and two-dimensional flat sculpture by Annamarie Bova, etc. etc. Generally speaking the displays are on premises spread through the traditional shopping streets from the San Ferdinando and Chiaia sections in the east (roughly starting at via Chiaia, near the Royal Palace) and then west to the Posillipo area past Mergellina. I am almost certain that the displays are all indoors. If there are exceptions involving real "street art," I haven't found them. 11. Also for 2012, Opera per Cantalupo. See this link. 12. For Christmas 2016, there was an unusual display of a large, LARGE Christmas tree that doubled as an observation tower and tripled as a shopping center. See for yourself.